I’ve been meaning to write this for a while, but especially now with the announcement of Tamriel Unlimited, I feel that now is the time to write my thoughts of the game. For some context, I have been playing ESO for 265 hours (according to the in-game counter) on one character - granted, probably at least 20 of that was for wiki work - and it’s the second MMO I’ve played, after Guild Wars 2. I’ll cover the basic “feel” of the game vs the main-series games, the music, the amount of things there is to do, what's changed since beta, and so forth. Read after the break to view my thoughts on the game…. When people ask me what this game is like, I generally say “If you’re an Elder Scrolls fan, it’s worth a try; if you’re more of an MMO person, then this probably isn’t for you.” ESO undeniably offers less options than games like GW2, with no major world bosses, arena-based PVP, and so forth. Instead, the focus is more on the quests and the world of Tamriel itself, which is why I recommend it more to fans of Elder Scrolls. Don’t be expecting another Skyrim, though. The dungeons are fewer and less complex. Due to its MMO nature, the quests aren’t as in-depth, and it’s mainly the quest-related NPCs that get the characterization. That doesn’t mean that it’s lacking, however: a lot of quests have stayed with me, whether they were sad and touching, made me laugh, or just say “Hey, that’s cool”, and there’s definitely some great characters too. I think the biggest draw to me is just being able to experience Tamriel, to see all these places that we’ve mostly only heard about, and to see the lifestyles and cultures of the various races. As far as game mechanics go, there’s definitely some changes that will take adjusting to if you’re used to the way an ES game works. The biggest ones are probably the character class and hotbar abilities; you’re probably going to rely on those abilities just as much as, if not more than, your weapons, and there’s a lot to choose from. Your character remains highly customizable, however, as seen by ESO’s featuring a different fanmade build every week or so. It works differently from a main-series game, however, and so it’s worth a mention here. (Oh, and on the topic of character creation, it's excellent in ESO - characters look fantastic appearance-wise, and there'a a lot of options.) I think I might make another blog post detailing what to expect as far as changes like this if you’re a regular-series player who plans to play ESO. Having other people in your Elder Scrolls world is definitely a big difference. When you’re questing out in the wilderness, you’ll typically come across a player once in a while, whereas the cities are usually a bit more populated. It is a bit immersion-breaking to see groups of players surrounding a bank clerk, crafting station, etc, and it might be worse once 1.6 hits - at least at first while it's new - which gives players the ability to attack and kill nonessential NPCs. But overall seeing other players around makes the world feel alive and more realistic, like it should, and that’s a big plus to me. And there’s definitely a lot of potential for roleplay, as well. Most of my experience so far has been singleplayer – I’ve not done much PvP or group dungeons or trials, and I usually quest solo – but it's nice to be able to chat and do things with your friends, or to just say “hey, wanna do that boss together?” to someone you come across in the wilderness, and ending up making a new friend. I’m going to just say this right here: the game looks and sounds amazing. Even on an average machine the graphics are decent enough, but on a gaming rig it’s absolutely beautiful. Even after getting used to the gorgeous landscapes of Auridon, Valenwood, and Cyrodiil with my character, there’s still lots of moments where I just have to stop and take a screenshot. (I've taken over 10,000 so far; mostly wiki work, but a couple hundred simply because I thought the scenery looked nice.) 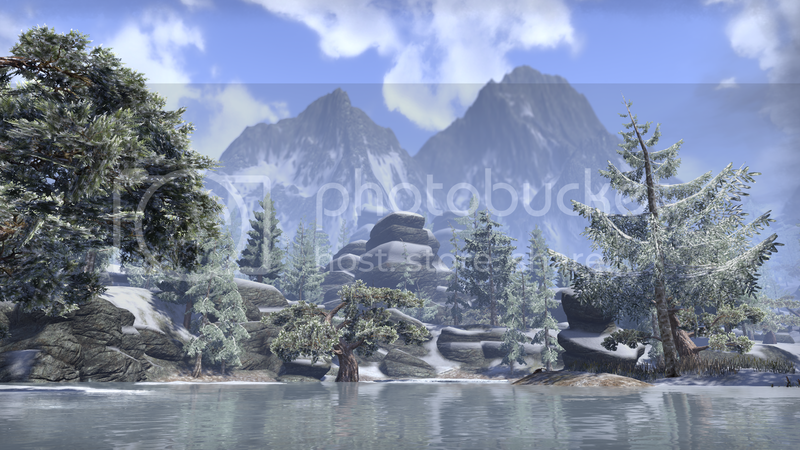 I love this blog that features panoramic “photos” of ESO’s landscapes. The main theme might be Jeremy Soule’s only contribution to this game’s soundtrack (Brad Derrick and Rik Schaffer composed the rest), but the soundtrack fits the game and fits with ES (even using some motifs from previous games – I smiled in beta when I heard a bit of “Watchman’s Ease” in one of the tracks.) Bards make a return in this game too, with a surprise: Malukah, known for her covers of the bard songs from Skyrim, was commissioned to write the music to 10 bard songs – and she’s one of the voices, too. The credits song, Beauty of Dawn, is also by her, an entirely original song that Zenimax had asked her to write. There’s a lot of good voice acting in here too. Some of the main characters are big-name actors – Michael Gambon as the Prophet, Kate Beckinsale as Queen Ayrenn, and John Cleese as Cadwell, to name a few. Aside from those, there’s a good variety of voices to bring to life the citizens of Tamriel, similar to how Skyrim had a decent range of voices – and every NPC’s dialogue is voiced and animated. There is plenty to do in this game; there’s hundreds of hours of opportunity. Now, note that I haven't done any veteran content (haven't reached the level cap yet; I'm level 43 with the cap being 50 with an additional 14 veteran levels), nor have I done much PvP or group dungeons. But during my 265 hours of play, I've completed 5 of 6 Aldmeri Dominion zones (Khenarthi's Roost, Auridon, Grahtwood, Greenshade, and Malabal Tor) and a good amount of Cyrodiil as well. And that's only one Alliance - each of the three have about the same number of large zones with their own quests and a main Alliance questline (and you're actually able to explore all three Alliances areas on each character during endgame.) You can get an idea of how big the explorable areas in the game are by looking at our map here on UESP. Cyrodiil's got plenty to do, too. It's not just PvP: there’s NPC quests, many of them repeatable, scattered around the region, and daily quests too (go to this fort, or kill enemy players of a certain class, for instance). It's kind of fun to run around completing quests while also watching your back in case you get ambushed by an enemy player, or to get swept up in a battle in progress. (One of my favorite moments was when I saw some enemy players coming and hid behind a tree, and they rode around on both sides of the tree without seeing me and got into a skirmish with some players from my alliance who were coming up the hill right in front of me.) You can always choose a less populous server, of course, if the constant danger isn't your cup of tea. There’s group dungeons throughout the world, and Craglorn offers veteran-level questing, dungeons, and 12-person trials. And if you get bored, there’s always achievements to unlock, which also has the added bonus of unlocking a color to dye your armor. These can range from being as easy as swimming out far enough for slaughterfish to kill you, to as difficult as becoming emperor. Even though some of this, such as Craglorn, have been added since the game launched, everything through update 6, which is currently on the test server (set to go live later this month), is included in the initial purchase for both consoles and PC/Mac. Overall, it's worth the price tag for what’s available. And with several DLC planned, there'll still be more to do in the future as well if you wish to pay for an expansion. One thing that I mentioned previously is that there’s a lot of potential for roleplay. I come across players roleplaying from time to time, and there’s plenty of guilds set up specifically for it. I once entered a city during my adventures and came across an auction, where players were selling game items, all done in-character, which was fun to witness. I discovered later that that's a regular event, which occasionally gets advertised on the official ESO social media channels (for example, here's an article on ESO's site featuring fan creations, with several planned events listed). Things like that make this community pretty cool. UESP has a guild on each server, too! We chat and run dungeons together, and have guild events such as fishing contests and skyshard-hunting. If you want someone to chat with, need help in-game, or want to participate in one of our events, feel free to join. Check out this thread on the forum for contact information for the officers, and the guild page on the wiki for more information about the UESP guilds in general. Did you play during beta, or just after launch, but were on the fence about the game? It has improved a lot since then, I can assure you. While it was quite buggy during beta and launch, I rarely ever run into a bug anymore, and if I do, it’s never game-breaking or quest-impeding; fixed with logging out/in at worst. Gold spammers were taken care of early on and are absolutely gone. They have added a lot to the game: some of the more anticipated updates were the Craglorn zone and Crypt of Hearts dungeon, and the ability to dye armor. 1.6 is the largest one yet with some major changes included, the biggest being the addition of the justice system. They’ve also been listening to their players and have made changes based on requests: for example, one upcoming change in 1.6 that people asked for is implementing "collections" to store your mounts and vanity pets and costumes so that you don't have to take up spaces in your bank. This mmorpg.com article has an excellent rundown of what was included in each update from launch until now. In Conclusion: Should You Try it? If you had asked me this while the sub fee was the only payment model, my answer would have been more of a "yeah, maybe"; it really just depended on how you felt about the game and whether you'd get as much out of it as me, because the sub fee did add up to a lot over time. But now that the payment model is set to change in March, the answer is a definite "yes." There's a whole lot to do in the game, and it's well worth the initial price. Hope to see you in Tamriel soon! Great review! Extensive yet easy to grasp for new players. We have a lot of content ahead of us and the player base is likely to expand now when Tamriel Unlimited is released. I hope the community will stay as friendly, fun and innovative as now! Great job! Enjoyed every line of it. Thank you for your kind words and linking to my blog. Great read! Now that the game is going to be cheaper than ever to try, I’d certainly like to give it a shot.